A Bentley R-Type Continental Fastback, Mercedes-Benz 300 SL Gullwing and a Ferrari 250 GT Lusso are offered at Gooding Pebble Beach 2018. Gooding announced several significant cars that are largely unknown in the car collector community for the Pebble Beach 2018 classic car auction. These well maintained but unrestored cars include the first production 1952 Bentley R-Type Continental Fastback (estimate: $1,500,000 – $2,000,000), a 1956 Mercedes-Benz 300 SL Gullwing steeped in Hollywood history (estimate: $1,100,000 – $1,300,000, offered without reserve), and a 1964 Ferrari 250 GT Lusso (estimate: $1,400,000 – $1,800,000) last seen in 1978. Gooding will offer several important maintained but unrestored cars at the annual Pebble Beach auction. These include several important cars that haven’ t been shown in public for many decades. The R-Type Continental created a template for Bentley grand touring cars that lasted decades, and this 1952 Bentley R-Type Continental Fastback (Estimate: $1,500,000 – $2,000,000) was the first production example built – appropriately designated chassis BC1A. The H.J. 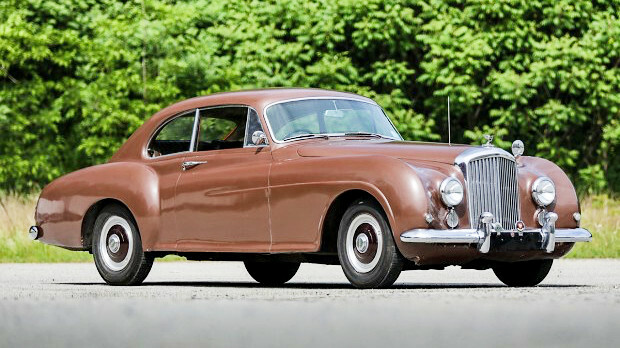 Mulliner Fastback was finished on May 2, 1952 and was specified with desirable features such as alloy bumpers, lightweight bucket seats, a manual gearbox, and custom appointments. After a 393-mile test at the M.I.R.A. proving grounds, overseen by Bentley’s chief engineer, the car was sold to its first owner in Paris through Franco-Britannic Automobiles. In the late 1950s, the Continental was sold to a US customer through Ed Jurist’s famed Vintage Car Store in Nyack, New York. The Bentley has continued to reside in New York, most recently in the hands of a long-term caretaker. The Bentley is presented in Antelope brown over a brown leather interior. 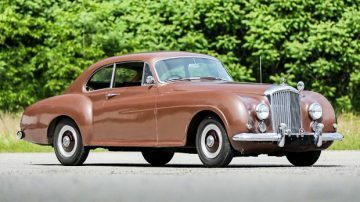 As the first example of a landmark model, this is one of the most important postwar Bentley automobiles ever to come to auction. This unique opportunity to acquire BC1A, a significant Bentley that has been in hiding for 45 years, is an occurrence that will not be repeated. 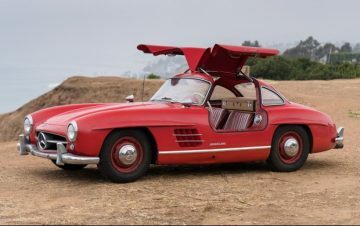 This recently discovered black-plate California 1956 Mercedes-Benz 300 SL Gullwing (Estimate: $1,100,000 – $1,300,000 Without Reserve) was delivered new in white (DB 50) over red leather interior and first sold to Roger M. Andrews of Los Angeles. Mr. Andrews was a Second Unit Director and Assistant Director on over 17 popular films, but after passing away in 1957, the car was sold to one of the original developers of Hollywoodland, L. Milton Wolf. Wolf is most famous for his magnificent, castle-inspired home in the Hollywood Hills known as “The Wolf’s Lair.” Wolf had the Gullwing repainted red in the early 1960s and the car remained in his family for nearly six decades. Offered without reserve, this unrestored Gullwing still retains its original books, tools, and fitted Karl Baisch luggage. This is a wonderful opportunity to acquire a blue-chip collector car that possesses a significant Hollywood provenance, long-term single-family ownership, and a lovely patina. The beautifully sculpted 250 GT Lusso is widely regarded as one of the most beautiful designs Pininfarina ever penned. With a muscular stance, and highly detailed cockpit, these sporting good looks are paired with the venerable Colombo-designed V-12 engine producing 240 hp. Famous Lusso owners populated a list of the era’s luminaries, including Hollywood’s King of Cool, Steve McQueen. 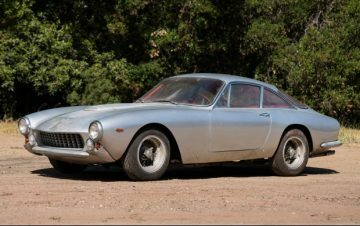 This 1964 Ferrari 250 GT Lusso (Estimate: $1,400,000 – $1,800,000), chassis 5201 GT, was the 162nd of only 350 Lussos built and sold new through US distributor Chinetti Motors in New York. The car eventually found its way to Southern Florida and has been parked in static storage since 1978. Today, the car is presented in silver over red leather interior, shows just over 30,000 miles on the odometer, and is complete with its original matching-numbers engine. This untouched rarity, whose whereabouts has been unknown to the Ferrari community until now, will make an exciting addition to the most accomplished Ferrari collections. 1965 Aston Martin DB5 (Estimate: $750,000 – $900,000) – a rare factory left-hand drive example with optional air conditioning and aeautifully preserved original interior. 1967 Ferrari 330 GTC (Estimate: $600,000 – $700,000) – a European delivery car with original upholstery and one owner for over four decades. 1961 Jaguar E-Type Series I 3.8-Litre Roadster (Estimate: $100,000 – $125,000 Without Reserve) – a desirable, early-production “flat-floor” model with single-family ownership from new. 1965 Porsche 356 SC Cabriolet (Estimate: $225,000 – $275,000 Without Reserve) – an exceptionally well-preserved example with only two owners and less than 31,000 miles from new.